The Sony Xperia ZL2, successor for the Xperia ZL is now official in Japan. The second generation device in the ZL series comes with high-end specs, and as the introductory video suggests, the smartphone comes with the water resistance, unlike its predecessor which didn’t have that feature. The timing was the same as it was last year, when Sony announced the Xperia ZL after the flagship Xperia Z, and now after the Xperia Z2 came into existence in the world, the Xperia ZL2 is being announced. The front is the same as in the previous version, as the Xperia ZL2 has a 5-inch 1080p display, which is complete by Sony Mobile BRAVIA Engine 2 and X-Reality engine. The bezel area is quite a lot reduced and there is lesser footprint in this. The internal powering in the Xperia ZL2 is quite good, with the device having the Qualcomm Snapdragon 801 processor, the MSM8974AB chipset – quad-core clocking at 2.3 GHz along with 3GB of RAM. A plus to that, the Xperia ZL2 has an internal storage of 32GB with the MicroSD card slot for the expansion of storage to a maximum of 128GB. Although the size of the screen doesn’t change, the ZL2 is bigger and heavier than its predecessor, with the dimensions being 137 x 72 x 10.8mm (compared to 131.6 x 69.3 x 9.8mm of ZL), and the weight being 167 gm compared to 151 gm of the Xperia ZL. The camera department isn’t bad either, as Sony has used the 20.7MP camera with the Exmor RS sensor and 1/2.3 aperture, and voila, this becomes yet another smartphone for this year which is coming with the 4K video recording capability. The video recording would give a resolution 3,840 x 2,160 pixels while the still pictures come with the maximum resolution 5,248 x 3,936 pixels. The phone comes with a 3000 mAh battery which is non-removable, just like you see in most of the recent Sony Xperia smartphones. Apart from the connectivity options like Wi-Fi 802.11 ac, Bluetooth 4.0 and NFC, the network connectivity would depend based on the market where this is going to be sold. The Xperia ZL2 runs the Android 4.4 KitKat OS with the Sony Xperia’s own UI on the top of it. This is the same UI as seen in the Xperia Z2. We’ve got no information about the water and dust resistance, but given the last few seconds in the promotional video from Sony, the Xperia ZL seems to be taking the water flow on itself easily, and thus this could be a waterproof smartphone. Thus, an option with smaller screen for those who wanted a comfortable option similar to the Xperia Z2, the flagship from Sony which was recently launched. 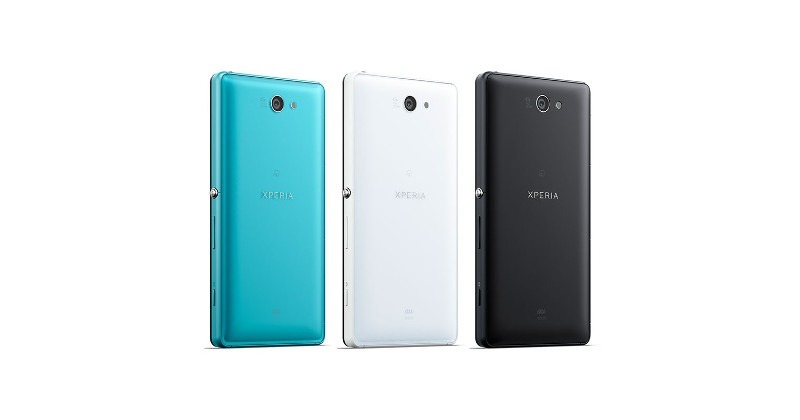 The color options in which the Xperia ZL2 will be available, includes standard black, white as well as a turquoise one if you are someone looking to flaunt something different. The Sony Xperia ZL2 is expected to hit the Japanese market soon, and later would be followed by the launch in the other markets around the world.